Adrien Jouary is in the Champalimaud Neuroscience Programme, Champalimaud Centre for the Unknown, 1400–038 Lisbon, Portugal. Christian K. Machens is in the Champalimaud Neuroscience Programme, Champalimaud Centre for the Unknown, 1400–038 Lisbon, Portugal. Our thoughts are hidden from sight, buried deep in the brain. Although this is undoubtedly beneficial in daily life, it is a serious drawback for neuroscientists: because much brain activity does not translate directly into behaviour, its function is difficult to determine. In a paper in Nature, Reiter et al.1 take a step towards circumventing this problem. The authors studied cuttlefish, which can change their appearance on the basis of their perception of the external world — in essence, they display some of their ‘thoughts’ on their skin. Using a range of state-of-the art techniques for computer vision, spectrometry and biomathematics, together with electrophysiology, the group exposes one of the most complex systems of motor coordination ever recorded. Cuttlefish, like squid and octopuses, are cephalopods. They have one of the largest brains among invertebrates, and can memorize complex spatial relationships or episodic events — abilities conventionally associated with mammals and birds2. These brainy molluscs lack a protective shell, but have evolved a sophisticated display system that enables them to quickly transform the colour and patterning of their skin in response to a changing perception of the world around them, generating a broad range of patterns used for camouflage, deception of prey or sexual communication3. The cuttlefish skin contains millions of cells called chromatophores, which can produce tiny dots of colour (yellow, orange, red, brown or black). If the radial muscles that control a chromatophore are relaxed, the pigments are imperceptible. But muscle contraction produces a colourful pixel several tens of micrometres wide4 (Fig. 1). When viewed at a distance, the millions of individual pixels form a complex image in the style of a pointillist painting, displayed on the animal’s skin. This process is orchestrated by many motor neurons, which innervate the radial muscles of individual chromatophores to control their contraction. Figure 1 | Thoughts on display. Chromatophores are pigmented cells found on the skin of cuttlefish. Modulations in muscle contraction determine whether or not the cells’ pigments are displayed, producing a changing patterning system that the animal uses for camouflage. 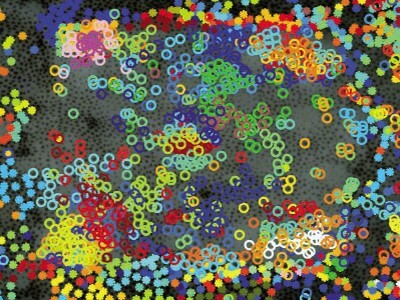 Reiter et al.1 used computer-vision tools to track tens of thousands of chromatophores. The authors’ investigation reveals how skin pattern is controlled and how it varies over time. In response to changes in the cuttlefish’s surroundings, the muscles that control groups of chromatophores contract or relax in unison, to produce a coordinated alteration in skin appearance. Cuttlefish move rapidly, and because they are soft-bodied, frequently change shape. This constant flux presents a huge technical challenge for studies of individual chromatophores, because such analyses require imaging techniques that can keep track of individual cells between frames of video footage. Reiter et al. found that each chromatophore is surrounded by a unique arrangement of neighbouring chromatophores, akin to a fingerprint that could be picked out in a single frame, despite changes in skin pattern. By following the characteristic fingerprint of each chromatophore in the video footage, the researchers were able to simultaneously track tens of thousands of cells over time. This enabled them to study how the control of individual chromatophores produces the complex skin patterns formed by the cell population as a whole. Reiter et al. showed that new chromatophores are generated in regions in which there are no existing ones, with a simple local-repulsion rule ensuring an even spread of the cells across the skin. The authors found that the same rule could explain the patterns of chromatophore formation seen in other species of cephalopod. These findings suggest that evolutionarily conserved molecular interactions govern chromatophore positioning — a proposal that should be investigated in the future. The rule also explains how the cuttlefish display system maintains a steady functionality despite the animal’s continuously increasing body size. Next, the researchers investigated the dynamics of radial-muscle contraction and relaxation around tens of thousands of chromatophores. They discovered co-variations in muscle movements at many spatial scales, indicating that chromatophores are regulated by modules of motor neurons that function in synchrony, and that operate on skin patches of different sizes. The smallest modules consisted of fewer than ten adjacent chromatophores of the same colour. By contrast, larger modules, when contracted in synchrony, displayed more-complex shapes, such as rings, rectangles or disjointed structures resembling eye spots. 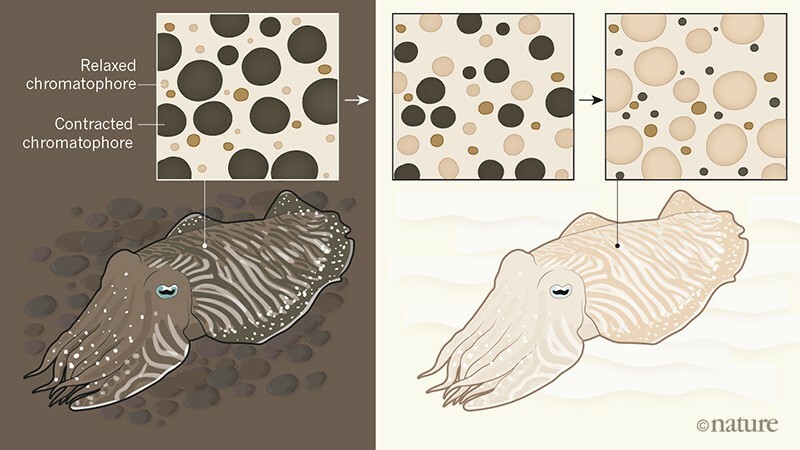 These results pave the way to investigating how the geometry of these modules gives rise to the camouflage motifs seen in cuttlefish in their natural environment. Finally, the authors studied chromatophore responses to changes in the cephalopod’s visual environment, for instance when an investigator passed a hand above the animal, causing its skin pattern to change. They found that chromatophores display a highly coordinated choreography over time — reminiscent of the choreography of neuronal-population activity during movement5. Strikingly, chromatophores went through the same sequence of contractions and relaxations each time the test was repeated. This indicates a remarkable level of fine control by motor neurons, and highlights the potential of cuttlefish studies to deepen our understanding of complex motor systems. Reiter et al. have achieved a breakthrough that will allow researchers to study this motor system in much more detail than was previously possible. The next challenge will be to determine how cuttlefish change the 3D texture of their skin for camouflage on sand, algae or corals. This process involves sets of muscles called papillae that create bumps and lumps. To gain a complete understanding of the animal’s display system, chromatophores and papillae should be studied together. The authors’ advance also has implications for visual perception and motor control more generally. For instance, we should now be able to gain a better understanding of texture perception in both cephalopods and their vertebrate predators, by investigating which visual features in the cuttlefish environment drive skin-pattern choices. Given that we can read the perceptual state of cuttlefish on their skin, it might also become easier to investigate the brain activity that translates visual perceptions into motor outputs. Furthermore, because cuttlefish coordinate millions of muscles simultaneously, they could provide insights into the principles underlying motor coordination. The authors’ findings suggest a hierarchical organization of motor-neuron modules, in which higher-level modules control complex, global skin patterns and lower-level modules control simple, local motifs. Such a hierarchy of motor controllers has long been thought to be a key principle underlying behaviour in most animals, including humans6. However, recording the activity of every muscle in a human is currently impossible. The simple readout provided by the skin-display system of cuttlefish could well lead us to a greater understanding of motor control. Reiter, S. et al. Nature 562, 361–366 (2018). Mather, J. A. & Dickel, L. Curr. Opin. Behav. Sci. 16, 131–137 (2017). Hanlon, R. T. & Messenger, J. B. Phil. Trans. R. Soc. B 320, 437–487 (1988). Messenger, J. B. Biol. Rev. 76, 473–528 (2001). Churchland, M. M. et al. Nature 487, 51–56 (2012). Lashley, K. S. in Cerebral Mechanisms in Behavior (ed. Jefffries, L. A.) 112–136 (Wiley, 1951).